This article was sponsored by CloudBees. Thank you for supporting the sponsors who make SitePoint possible! Picture this: You start using Jenkins, probably with one machine. As both the number of projects and the size of the projects themselves start to grow, you start to add slaves. Slowly, your cluster of Jenkins servers grows, and you slowly start to lose your grip. What if your Jenkins master crashes? If you recognize this feeling or you want to avoid this, you definitely should read on. Consolidated navigation experience across all the client masters. Shared build slave resources that can be used by any client masters. Control of authentication and authorization schemes used by client masters. This enables features such as: single sign-on and consolidated permission schemes. Management of update centers used by client masters. 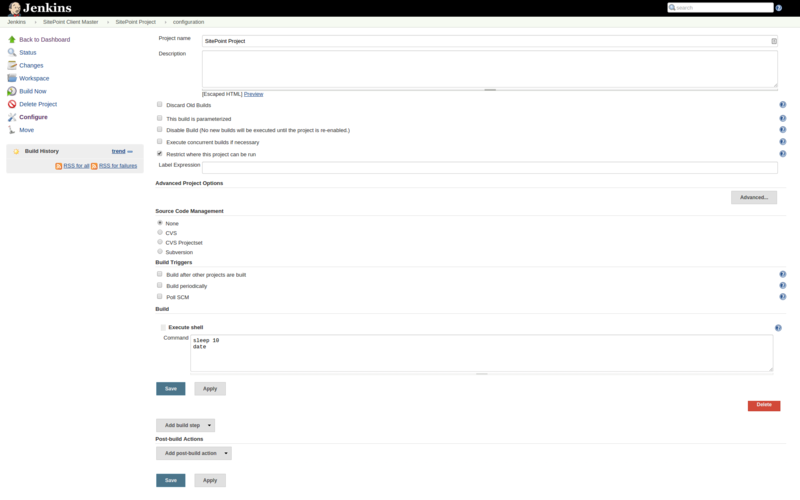 Consolidated management of Jenkins Enterprise licenses. Management and enforcement of certain key security settings on client masters. Within this article we’ll just use a small amount of the available features. We’ll be creating a client master and a shared slave. For this we will be using three separate servers. The first one will run CloudBees Jenkins Operation Center, the second one will run Jenkins Enterprise and the third will be used as a shared slave. We will be explaining everything in the next couple of chapters. I’ll be using three virtual machines on my local computer. If you want to follow along, you might want to make sure your own computer is powerful enough. If you happen to have three spare servers somewhere, you can also try it directly on those servers. The three servers will be managed through Vagrant. I created a multi-machine Vagrant file which will boot all three servers. If you’re not familiar with Vagrant yet, you might want to read this article. Note: All three boxes are running CentOS 7. You can easily replace them with Ubuntu boxes if you prefer, but do note that all commands below are meant for CentOS. We start by installing CloudBees Jenkins Operation Center on our first server. CloudBees Jenkins Operation Center is our main control hub to manage all Jenkins instances. We’ll be using it to create our client master and shared slave. After logging in to the first Vagrant machine by running vagrant ssh CloudBees Jenkins Operation Center in your terminal, you can perform the following commands to install CloudBees Jenkins Operation Center. You will receive an ok message to indicate CloudBees Jenkins Operation Center has been successfully installed and started. Before we can actually start using CloudBees Jenkins Operation Center, we’ll have to open the web service port to allow access as well as allow our other servers to access this server. We can do this by changing the firewall by running the following commands. By now, you should be able to reach CloudBees Jenkins Operation Center with the following URL: http://192.168.56.105:8888/. After entering the above URL, a registration form will show up. You can register for an evaluation license if you haven’t bought the product yet from CloudBees. Just fill in your details and press Next. When you’ve registered yourself, I recommend you update all the plugins. CloudBees Jenkins Operation Center requires some specific versions of plugins so we want to make sure we have these. Generally, it’s not recommended to update plugins when it’s not needed, as indicated in this article, 7 ways to improve Jenkins. On the client master server, we’ll install Jenkins Enterprise. Jenkins Enterprise is a commercial product like CloudBees Jenkins Operation Center by CloudBees. It’ll enhance your Jenkins experience by installing several plugins. You can enter the client master server by running vagrant ssh master on the command line. Now you can run the following commands to install Jenkins. Just as we did when installing CloudBees Jenkins Operation Center, we have to configure our firewall again. When you’ve performed these steps on the server, you can enter the Jenkins instance by entering http://192.168.56.106:8080/ in your favorite web browser. Once again, you’ll receive the option to register yourself. 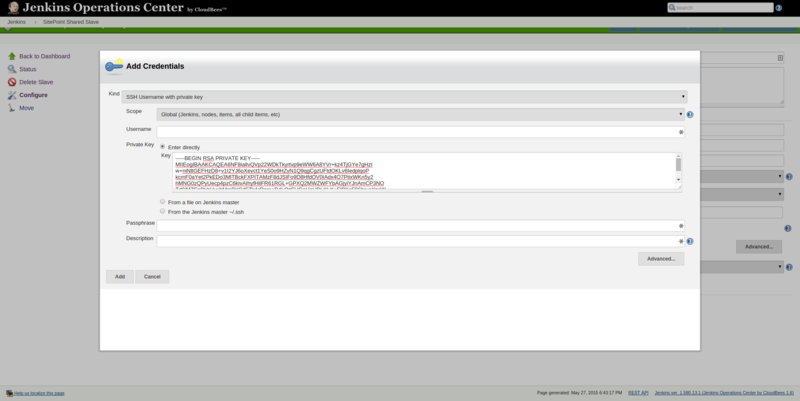 Fill in your details for an evaluation version of Jenkins Enterprise. 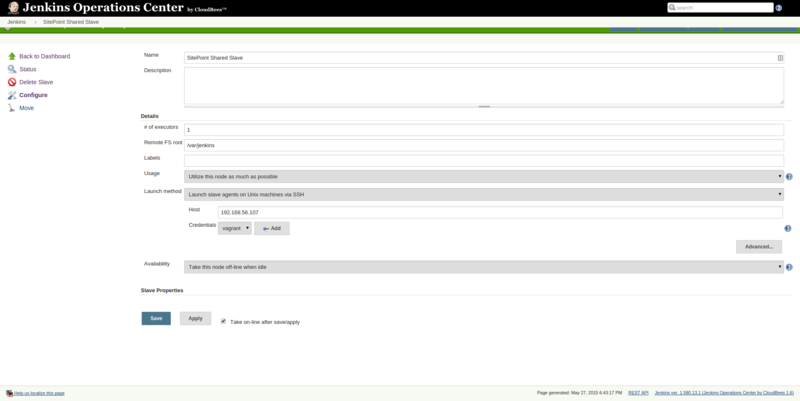 When completed, make sure you go to Manage Jenkins -> Configure System and set the number of executors to 0. By setting it to 0, we make sure that later on this client master uses any of the available shared slaves instead of building on the server itself. Install Jenkins Enterprise is one step. To create a client master out of it, we have to configure it in CloudBees Jenkins Operation Center. After entering CloudBees Jenkins Operation Center again, we click on new item in the menu and choose client master as our option on the CloudBees Jenkins Operation Center instance. After creating the client master, you can define several settings like which license type to use and whether there’s a specific user who manages this master. The latter option can come in handy when different people manage certain Jenkins instances. You can find more information about the available settings in the official manual. The default license is License (no dedicated executors). We can now connect this client master with the actual server. 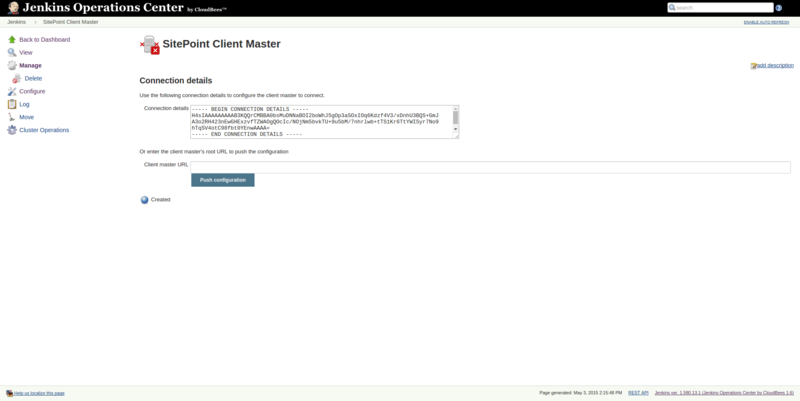 By filling in http://192.168.56.106:8080/ in Client Master URL and clicking Push Notification, we can connect our master instance with CloudBees Jenkins Operation Center. After confirming this connection, you’ll find a connected client master in the overview in CloudBees Jenkins Operation Center. The third server is our shared slave. A shared slave is, as the name implies, a slave which can be shared across multiple client masters. Whenever a client master needs a slave, it will retrieve a slave from the pool in CloudBees Jenkins Operation Center. Whichever slave is available and connected to the client master will be attached to the client master. A shared slave doesn’t necessarily need its own server. It can run on the same servers as our other instances (CloudBees Jenkins Operation Center & Client Master) or even multiple slaves can be run on one server. However, best practices mandate spreading the load by using a separate instance like we’re doing now. You can enter the slave server by running vagrant ssh slave on the command line. Now you can run the following commands to install Java. Now we have to make sure that we have a writable directory for our slave. We do so by running the following commands on the slave. To add a shared slave to CloudBees Jenkins Operation Center click new item in the menu and chose shared slave as your option on CloudBees Jenkins Operation Center. We are going to set up an SSH connection between the servers. For security reasons, it’s advised to communicate through SSH with a separate user. For now, we will be using the already existing vagrant user. If you would like to create your own user, check out this article. Here you can find out how to set up a public private key pair. On our own machine, we first run the following command on the command line. Copy the output that you get back. Now head back into your browser. In the last step, you filled in the host. Now click the “add” button for adding a credential. Choose ‘SSH username with private key’ in the drop down. Fill in ‘vagrant’ as username choose ‘enter directly’ for private key. Within the text box that appears, you can paste the content you copied earlier. Click on add when done. Next you can click on save to save this slave. The slave should now state that it is ready for lease. Until now, we’ve only been preparing our servers. We can now actually start to run a project and see the use of a shared slave. Log into our client master and create a new freestyle job by clicking on new item and then choosing freestyle project. We add a new shell build step with the following content. When you start building this project, you’ll notice two things. In the client master, you’ll notice that the project is being build on the shared slave. In CloudBees Jenkins Operation Center you will notice that the slave is being marked as ‘in use’. Of course this project is not realistic, but you can imagine your own project is now being built. The next step you probably want to do is add more shared slaves, so your client master has more slaves to choose from. Also, you want to create more client masters and assign your colleagues to a client master to manage. This way you can keep control using CloudBees Jenkins Operation Center while having multiple Jenkins servers dealing with your projects. Unfortunately, we’re at the end of the article. As you can imagine, we’re not quite production ready. To get to that stage, you’ll probably want to secure all your Jenkins instances with a single sign on and configure multiple shared slaves or perhaps a shared cloud. Also you could dive into generating analytics or configure the update centers. 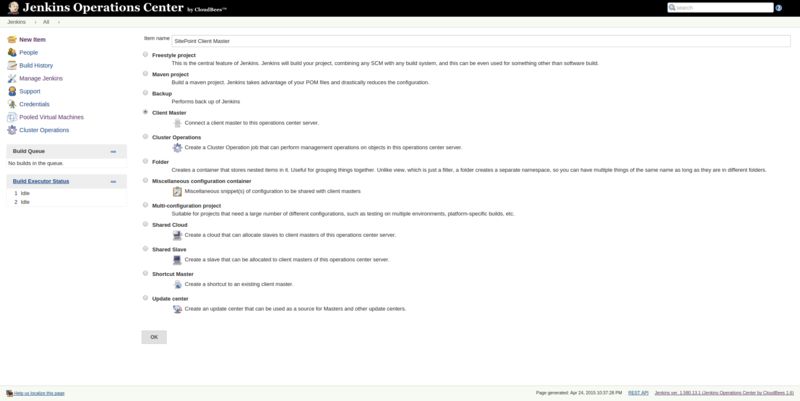 As you can see, Jenkins Operations Center is a great tool to manage your Jenkins instances and this article just showed you a small part of horizontal scaling your Jenkins cluster. Have you tried CloudBees Jenkins Operation Center yet? What did you think?